Derek W. Beck’s new nonfiction book follows the forgotten Dr. Joseph Warren through the beginning of the Revolution, from the Boston Tea Party and Paul Revere’s Ride to the daylong battle that began west of Boston, in Lexington and Concord, which in turn ignited a Revolution. Honorable Mention for Best New U.S. 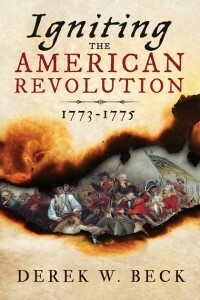 Revolutionary History Book by the Fraunces Tavern Museum, bestowed April 25, 2016.